For as long as I can remember, I have been attracted to dogs and have loved them, but I was able to really get started with them when I finished university. I moved to New York and started to work as a trainer and handler for an animal agency, which provided all sorts of animals, from dogs and cats to llamas and horses, for theater, films, advertising, and a variety of other purposes. At the same time, I acquired my own first two personal dogs, a Collie and a Canaan dog, and since then, over 45 years ago, I have been intimately involved with these two breeds. I emigrated to Israel in 1969, and my dogs accompanied me. I very quickly became involved in the dog world in Israel, and joined a small group of people who were interested in establishing a kennel with the major purpose of breeding and preserving the Canaan dog. We moved into several buildings that had been abandoned by the British in 1947 – they were in a state of ruin, with no facilities (we had no electricity or telephone there for 17 years), but with a huge advantage – we were surrounded by the forest and 4 kilometers away from the nearest village, so we could breed and raise dogs without disturbing anyone in conditions that were super for the dogs. I quickly became involved in the various doggy activities in Israel, participating in shows, training, and educational programmes – I had the privilege of attending the last cynological course presented by Prof. Rudolphina Menzel. In 1972 I became a judge of my first breeds, Collies and Canaan dogs, and since then I have added many breeds to my judging qualifications. For me the challenge is to learn more and more about the dogs, and to learn as much in depth as possible about each breed that I study, to be able to understand it as well as possible, and to learn even more about what a dog really is. I have worked for many years as a dog trainer for various purposes, have done a wide variety of things with my own dogs, including herding, agility, and nose work, as a consultant on behaviour problems, as an advisor to programmes for military dogs and herd guard dogs, as a research technician in animal behaviour projects at Tel Aviv University, and more. I am fascinated by dogs’ abilities as working animals and partners to man. Currently, I am an instructor in a school for dog trainers, and I lecture at home and abroad on a wide variety of cynological subjects, and write for a variety of publications. I have published several books, including a new edition of The Israel Canaan Dog published a year ago (www.icdb.org.il) and an autobiography, Tails of Shaar Hagai (available from www.amazon.com). When did you start your investigations with regard to Israel's national breed, the Canaan dog? I first met the Canaan Dog when I spent a year in Israel in 1967. I had never heard of it before and was captivated by this dog when I met it. I was fascinated by their closeness to nature, their adaptability, functionality and characteristics of an original dog, and by their very unique temperament, a dog that was willing to be a devoted partner but never a slave. From that time on, I became involved in the breed and have never been without a Canaan, and from my return to Israel, I have been learning as much as possible about it, living with a number of them, and breeding, showing and training them. And although it has been many years, I think there are still many things that they can teach me in the future. Was the Canaan Dog recognised at that time? 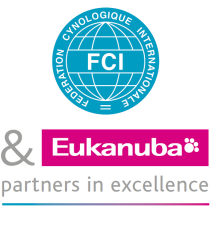 The Canaan was recognised by the FCI in 1966, due to the efforts of Prof. Rudolphina Menzel and the Israel Kennel Club. However, in Israel at the time, it was considered by most people to be a street dog or stray and was not respected as a breed. We had a great deal of work to do to gain acceptance of the dogs as a national breed and a very special dog worthy of the same consideration and respect as the more modern breeds. Have you always bred them? Have you ever bred other breeds too? There are two breeds that I have had from my beginnings as a breeder and exhibitor: Canaan Dogs and Collies. They are very different from one another, and in many ways compliment one another. I love both breeds for different reasons and can not imagine living without either of them. I breed rough and smooth Collies, I have produced many champions and have got other titles, but I am most proud of the fact that there are over 30 Collies bred by me working as service and therapy dogs for people with a variety of disabilities, such as Alzheimer’s, epilepsy, and autism. I have worked hard to develop a line of dogs that will be beautiful and also with the correct temperament allowing them to work in such a demanding and stressful field. In the past, I also had Border Collies, and Shiba Inus, but decided that to achieve my goals, it would be better to concentrate on the Canaans and Collies. I now have three Portuguese Podengos pequenho which I imported this year, as I was looking for a small breed that would be suitable to be therapy dogs. I am very pleased with my choice, they are lovely little dogs and work wonderfully well. What were you first Canaan Dogs to start your breeding programme with? Where they bedouin dogs or pedigree dogs? The first Canaans in my breeding programme were from two sources – a small number of them were dogs from the breeding of Prof. Menzel, some pedigreed, and some that had been brought to her from the Bedouin, and the larger proportion were dogs that we obtained from the Bedouin or that were wild born and were caught and offered to us. In the first years, I would bring new dogs to Prof. Menzel to assess, so that we could together decide if they were worth introducing into the breeding programme. Although I now have many generations of my breeding, I still am very interested in bringing in new Bedouin and free born dogs when it is possible to find them. Your relation with the Bedouin tribes are famous. Can you tell us a little about it? How pure are the desert breeds? We only bring in desert breeds when we are quite sure that they are pure. It is becoming very difficult these days to find new stock, but they do still exist in the more remote areas. We will only accept dogs that come from areas that are distant from settlements, and where we do not see evidence in the area of other types of dogs. Survival in the desert and with the Bedouin is very difficult, and we feel that dogs that are able to live and survive there, and that look very typical, are very likely to be pure. Of course, other than judging them only by appearance, we do test breedings with desert stock to be sure that there are no surprises. One interesting point that I want to make is that the Bedouin here in Israel also have Salukis. However, it is very rare for the Salukis and the Canaans to be found in the same camp or area – the dogs are used for completely different purposes, and the Bedouin who keep Salukis are keeping them for a different reason than the Bedouin that keep Canaans. Dogs for them are not pets or kept for sentimental reasons, they are tools and are used for work, hence the breeds are not mixed. Even National Geographic heard about your work and relation with the Bedouins, can you tell us something about this too? National Geographic was planning a programme on the origin of the dog, and wanted to photograph some of the few primitive breeds still surviving in various parts of the world. The Middle East has always been considered one of the possible sites of the origin of the dog, so it was natural that they would be interested in filming the Canaans for the programme, especially since they still do exist in the wild and are attached to the primitive life style of the Bedouin. They got in touch with me, and I was happy to make arrangements for their photographer to accompany me to Bedouin camps and the areas where we knew there were likely to be free living Canaans. We had one great stroke of luck – at the time planned for the filming – and it was all done in three days – one of my females was in season, and we were able to take her along and do a breeding in a Bedouin camp. This was a great addition to the film, showing the lengths we go to in order to get new bloodlines. The film, “Search for the First Dog”, was quite successful and is still shown on the National Geographic Channel. What was your biggest frustration concerning the breed? My greatest frustration is what has been happening abroad, where breeders have decided that they know better than we do what a correct Canaan is, and have started to breed and promote types that we feel are very incorrect. We are very selective in our breeding and have tried throughout the years to retain the type that was originally considered to be ideal by Prof. Menzel and according to what we observed ourselves in the desert and with the Bedouin. But there have been breeders abroad that seemed to feel that everything was good for breeding and when dogs were produced that did not fit the standard, then the standard could be changed to fit the dogs. In some cases, the studbooks were closed for some time, and a good deal of inbreeding was done, which not only resulted in dogs of poor type, but also in various health and genetic problems which were unknown here. I think it is extremely important to preserve the true primitive type, both for the good of the breed, and also because of the importance to the dog world of understanding what a true primitive dog is and what the characteristics, both physical and mental, are – this is the basis of all of our dogs and is invaluable, there are few primitive dogs left in the world. The situation started to improve in recent years, with more exports from Israel to various countries, and an interest in improving the type, health and temperament of the dogs, and I am very pleased to see things moving in this more positive direction. Achieving international recognition and appreciation of the breed. The Canaan Dog is today recognised by the whole world’s kennel clubs, and is bred in many countries. Interest in the breed is growing, but not in an exaggerated way – the Canaan is not becoming a fashionable dog, but one that people are interested in as a natural and healthy breed. I feel that the breed now can survive and will be bred and not will be in danger of becoming extinct, as has happened to some other primitive types. I am proud that dogs from my breeding here at Shaar Hagai are behind a very large percentage of the Canaan dogs in the world. Do you get some help from other breeders? There are some other breeders in Israel who are very involved with the breed, however, none of them has the facilities to keep a number of dogs as I do, and to raise more than an occasional litter. It is difficult in Israel to find a place where one can be a breeder with a number of dogs, the neighbours are not very cooperative. I am fortunate in being in a rather remote place (by Israeli standards) without neighbours to complain. There are a good number of breeders in other countries, many of whose breeding is based on stock that they had originally from me, and who periodically import new dogs from Israel. We are regularly in touch, and I feel I can also depend on these breeders to promote the breed and produce quality dogs. And what about the support from the Israel Kennel Club and the relation/interest of the Government with regard to this heritage? The Israel Kennel Club has always totally supported the Canaan Dog. The Canaan is officially the national breed of Israel, and all Israeli judges are required to learn about it. In the past, I have had some support from the kennel club in taking dogs abroad to important shows, and they are always ready to assist us in activities and promotions of the breed. We have had several international Canaan dog meetings and seminars in Israel, which have been supported by the kennel club, and we are planning another such event in March 2015. The government is another story. The Israel government has no interest in dogs, and has never given us any real support. Presently, a government agency, the Israel Lands Authority, is trying to evict us from the property we have lived in for 45 years. The situation is very complex and is in court now (the case has been going on for two years so far), but the fact that there have been a lot of protests about this from here and abroad (there is an on-line petition with over 40,000 signatures, and many comments about the Canaan being our national heritage - http://www.thepetitionsite.com/1/save-shaar-hagai-canaans/ ) is of no interest to the government, it seems. If we are evicted from here, it is very unlikely that we would be able to establish a new kennel – it is very difficult to find a place to breed dogs in Israel, and we do not have the funds for building a new place. If this happens, it may mean the end of possibilities of continuing with bringing in new bloodlines from the desert. What is your biggest concern about the future of the breed? My biggest concern about the future of the breed is that future breeders will try to turn the Canaan into a generic dog, a pet for everyone, and will not continue to preserve its unique and very special characteristics, both physical and mental. Man has created many dog breeds which suit a wide variety of purposes, and today the most widespread purpose, and one that is getting more and more common in all breeds, is for a nice, easy to manage, calm, friendly, soft pet. The Canaan is one of the few dog breeds still existing that can teach us what a dog really was when it first decided to become a partner of man, and I think it would be a tragedy to lose this. For me, it is important that the Canaan continues as true to its origins as possible, so that we can learn from it, and share a true partnership with a really special dog.